Sadly strong winds made sailing impossible for the forty-three strong International Six Metre fleet on the second and concluding day of the Société Nautique de Genève's Annual Regatta at Sea in La Trinité Sur Mer. The race committee initially held the teams ashore in the hope that conditions would abate, but sadly by 13.00 it became clear that the situation was not improving and racing was cancelled for the day. 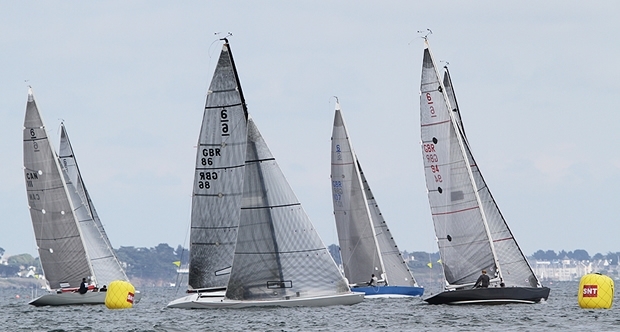 With two races completed on the opening day, the Annual Regatta at Sea was validated and Paul Smith's Valhalla, the current British Six Meter Champion and winner of the 2012 European Championship in Nynashamm, claimed overall victory and the prestigious Annual Regatta at Sea Trophy. Second place overall went to Basil Vasilou's Jane Ann, while third place was a tie between Stefan O'Reilly-Hayland's Tsigane, being co-skippered this week by Nayl Driss and Brice Bertier, and Jan Marilley's Junior, whose past victories include the World Championships of 1999 and 2007 and the European Championships of 1996, 1998, 2000 and 2002. Although Junior might have had the upper hand on track record, in this regatta is was Tsigane who claimed the third step on the podium on count back. The Trophy for the winner of the Corinthian Division was awarded to Peter Hofmann's Llanoria, being helmed this week by Eric Jespersen, which was designed by Olin Stephens and was victorious at the 1948 and 1952 Olympics and the 1957 One Ton Cup as well as in both of yesterday's races. Second place in the Corinthian Division went to Louis Heckly's Astree, a two time Classic Six Metre European Champion in 1994 and 1996 who's past owners include King Constantine II of Greece. Thomas Kuhmann's Mena, the first British Six built after the war in 1948 by Camper & Nicholson, took third place overall. The competitors' attention now turns to the World Championship, which opens tomorrow and concludes on Friday 5 June. Eight races are scheduled with racing planned for Monday 1 through Thursday 4 June with Friday being a reserve day if required. The Gala Prize Giving Dinner http://www.fionabrown.phanfare.com/6917497will take place on the evening of Friday 5 June at the Regatta Marquee. As always the Classic Division has a strong entry of 23 teams, but this event is remarkable in that it has also attracted a large entry in the Modern Division, which has seen an enthusiastic resurgence of interest in recent years. This is a very welcome increase on the past entries of just 10 or 12 Moderns a few years ago. The title Modern Division is perhaps a misnomer since it incorporates boats built as early as 1967, but in a class which dates back to the 1920s that actually is quite "Modern"! The Six Metres hit their heyday during the era of the 12 Metres in the America's Cup, when the Sixes provided ideal test beds for many of the greatest yachting innovations of the era. Following the demise of the 12s in the America's Cup the Sixes saw a similar downturn, but in recent years discerning owners have seen their potential for truly first quality racing at a very affordable price. A top flight Modern with an excellent track record can be purchased for around £40,000 and there are a number of good second hand boats available at a range of prices. For sailors who enjoy the technical aspects of the sport the Sixes are a natural home. They allow owners and designers to bring the very latest technology and their own innovations to a boat. From exchanging outmoded hydraulics for cascade systems to redeveloping their deck layouts to incorporate the newest offerings from the hardware manufacturers and refining hull shapes to take advantage of the latest thinking in naval architecture the boats are constantly evolving. The quality of racing in the Six Metre Class, both Modern and Classic, is without doubt exceptional as is the quality of venues they choose to race at and as a result the fleet attracts sailors of the highest calibre. This week's crew list alone feature the likes of Olympic medalists Phil Crebbin, Eric Jespersen, Peter Holmberg and Alba Batzill, Etchells World Champion and legendary sailing coach David "Sid" Howlett, past Six Metre World Champions Tony Griffin, Yan Marilley, Steve Kinsey, Barry Van Leeuwen and Eddie Eich, 12 Metre and Classic Six Metre World Champion Jamie Hilton and 5.5 Metre World Champion Kenneth Thelen,to name but a few. John Pollard, professional sailmaker, multiclass champion and tactician aboard Valhalla sums up the attractions of the fleet succinctly saying, "They are very tactical and technical boats. It's the whole package and you get a lot of bang for very little buck. The rule creates great flexibility for the owner and designers to utilise their own individual ideas. Curiously they all still seem to arrive at the finish line at the same time. Very small increments can make big difference, making for some of the closest racing I get to enjoy. Often even closer than in some one design classes I sail."